Nissan locked out the front-row for Super GT’s season opener at Okayama after a dominant showing in qualifying on Saturday. 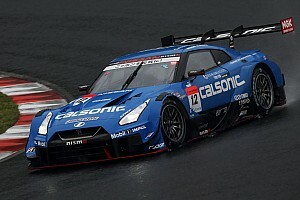 Ronnie Quintarelli and Tsugio Matsuda will line-up on pole position in the factory-entered NISMO GT-R, ahead of Impul duo Daiki Sasaki and James Rossiter. Nissan had already broken the lap record for Okayama in Q1, with Rossiter leading the timesheets with a 1m17.103s - nearly identical to the time with which he topped pre-season testing. But the times tumbled further in Q2, with reigning champion Naoki Yamamoto first to break the 1m17s mark in the #1 Team Kunimitsu Honda NSX-GT. Quintarelli immediately went quicker, setting a time of 1m16.602s that would secure Nissan its first pole since last year’s Fuji 500-mile round. Sasaki came closest to the Italian with his own-late effort, but still finished 0.274s adrift in second. Late improvements from the leading two Nissan teams demoted Yamamoto and Jenson Button's Honda to third, ahead of the Real Racing Honda of Bertrand Baguette and Koudai Tsukakoshi. Tomoki Nojiri and Takuya Izawa were fifth-fastest in the ARTA Honda, 0.621s adrift of the pole-sitting car but three tenths clear of the Kondo Nissan of Jann Mardenborough and Mitsunori Takaboshi. Mardenborough had placed the Impul car third in Q1, but Takaboshi was unable to replicate his teammate’s time and ended up sixth. Ryo Hirakawa and Nick Cassidy were the only Lexus runners to book a spot in Q2, the 2017 champions qualifying seventh in the #37 TOM’S LC500. 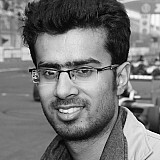 They beat B-Max Nissan drivers Kohei Hirate and Frederic Makowiecki, who were unable to set a competitive lap in Q2. 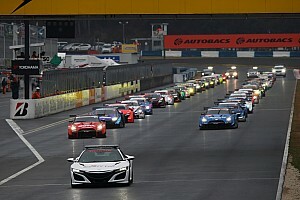 Kenta Yamashita and Kazuya Oshima were ninth-fastest in the Team LeMans Lexus, while the top 10 was completed by the sister Bandoh-run LC500 of Yuji Kunimoto and Sho Tsuboi. Ex-Formula 2 driver Nirei Fukuzumi kicked off his first full season in Super GT by securing pole position in the GT300 category. Fukuzumi, who shares the #55 ARTA Honda NSX GT3 with Shinichi Takagi, set a best time of 1m24.889s, beating the #96 K-Tunes Lexus RC F GT3 of Sena Sakaguchi and Morio Nitta by 0.016s. 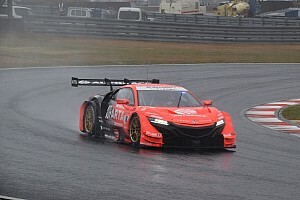 The result marked the first pole for Honda’s NSX GT3, which was first introduced in the series last year. Shigekazu Wakisaka and Hiroki Yoshida qualified third in the #52 Green Brave Toyota Mark X, which topped the first leg of qualifying but ended up two tenths off the pace in Q2. Aston Martin endured a difficult return to Super GT, with its factory-supported D’station Racing Vantage GT3 eliminated in Q1. Ex-Nissan GT500 ace Joao Paulo de Oliveira, who shares the new-generation Vantage GT3 with Tomonobu Fujii, reported gearbox problems on his flying lap and could only qualify 19th quickest..
McLaren’s own factory-supported team, operated by Team Goh, likewise couldn’t progress to the second part of qualifying. Alex Palou and Seiji Ara propped up the timesheets in the #720 720S GT3, finishing 1.4s off the pace in Q1. 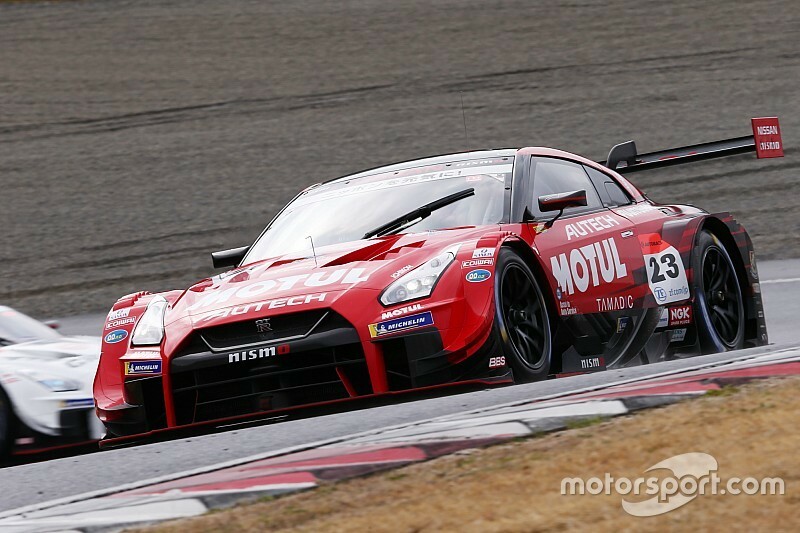 Super GT season preview: Can Button defend his crown?